What is Best Start and Why is it Important? As someone who has organized side by side with low-income and working class families in Los Angeles County, I know that communities have the power to transform themselves into safe, healthy and vibrant places. In the last year, I have met parents across the county who are passionate about improving their communities, and demonstrate that commitment by advocating for their children’s early care and education. It is inspiring and I applaud their efforts because change is not easy and change takes a long time to happen. For me, Best Start is a reflection of First 5 LA and its mission. It is partnering with parents and stakeholders to bring about the social change required to support our children in their readiness to succeed in school and life. As a husband and father to three boys, I know first-hand the hopes that parents have for their children and the challenges that confront them throughout the county. Through a place-based strategy, First 5 LA is building the leadership capacity of our families and communities to support and promote the safety, healthy development and well-being of children prenatal to age 5. "Without strong families and strong communities, we put the lives of our children at risk. At the same time, by not investing early in the health, education and well-being of our children, we are jeopardizing the future of L.A. County." Best Start is important because it recognizes parents as leaders and advocates in the prenatal to 5 arena. We know that our collaborative efforts need to be inclusive of parents, alongside policymakers, nonprofit leaders, early child care and education advocates and other critical stakeholders. Without strong families and strong communities, we put the lives of our children at risk. At the same time, by not investing early in the health, education and well-being of our children, we are jeopardizing the future of L.A. County. 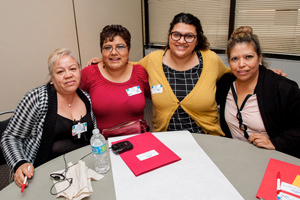 First 5 LA’s “Building Stronger Families Framework” (BSFF) believes that parents and other critical community stakeholders have the ability to improve the social conditions and policies that have an impact on their neighborhoods. This strengthening and alignment of family and community infrastructure is essential if we are to improve the outcomes for children and create a hopeful future for all who live here. It was a year ago this month that we launched the BSFF in the 14 Best Start Communities. At the heart of the BSFF are the Best Start Partnerships, which are collaborative groups of diverse stakeholders who come together regularly to address the most pressing issues for children and families in their community. The partnerships are a central component of First 5 LA’s capacity-building approach. A process we call Learning by Doing (LBD) is the partnerships’ vehicle in achieving results for their communities. LBD is really a way of empowering community members by taking them through a series of decision-making steps: looking at data; identifying core results significant to their communities; identifying a target audience; and then developing strategies and activities to create positive change in the form of civic engagement, social capital, organizational capacity development and community resource mobilization. At the same time, each partnership is strengthening their ability to sustain itself as a high-functioning, results-focused and diverse independent entity. More importantly, we’ve seen parents and residents emerge as leaders, engaging with other stakeholders towards creating and sustaining thriving and healthy environments for young children and their families. The Best Start Community Partnerships are en route to implementing strategies and activities in their respective communities. For me, the process leading towards community and systems change is about people power. For Best Start Communities, people power means parents and residents. It is exciting and a major milestone for us at First 5 LA.